You can request a copy of all non-identifying information relative to your birth parents and their extended family that may be in the file. This would include age, school attainment, interests and hobbies, employment, physical description, health issues known at the time of your birth, etc. The fee for this service is $150.00. You can request that we conduct a search and facilitate a reunion with one or both of your birth parents or a birth family member, if they are open to contact. This includes a summary of all non-identifying information available in the file. The fee for this service is $350.00. This buys approximately 5 hours of adoption staff time and in almost all cases we are able to complete the service within that time frame. If, during those initial five hours, we determine that it will take us additional time to complete the service, we will contact you with an estimate and enable you to buy additional hours of service at $85.00 an hour. If you prepared an adoption plan through Catholic Community Services, there are three services we can provide relating to your closed adoption files. You can write a letter to your file indicating your desire and willingness to be contacted by your birth child should any attempt at contact is made. Once they make the attempt and your consent is in the file, we can facilitate contact. You can add any piece of information on that letter. The fee for this service is $85.00. You can request a copy of all non-identifying information that was in the file relative to your birth child and their adoptive family at the time of his/her adoption. This would include age, school attainment, interests and hobbies, employment, physical description, health issues known at the time of their birth, etc. The fee for this service is $150.00. You can request that we conduct a search and facilitate a reunion with your birth child, if he/she is open to contact. The fee for this service is $350.00. This buys approximately 5 hours of adoption staff time and in almost all cases we are able to complete the service within that time frame. If, during those initial five hours, we determine that it will take us additional hours to complete the service, we will contact you with an estimate and enable you to buy additional hours of service at $85.00 an hour. 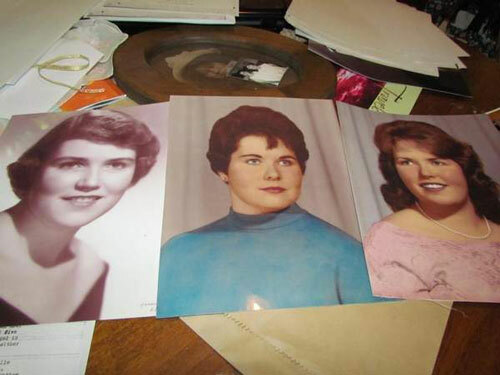 The three women are seated around a dining room table gabbing, with pages of documents and piles of photographs scattered before them. One interrupts another. The other interrupts the first. No one seems to complete a sentence, at least not on their own. They are trying to tell me about some gene they all share that causes a form of arthritis called ankylosing spondylitis, which causes inflammation of the spine and other joints. It confirms, they tell me, that they are indeed biological sisters. But they lose me, somewhere in the conversation, as the topic shifts to another shared trait and then another subject altogether. I can’t get a question in edgewise during my meeting with them earlier this month, so I just shake my head and smile, and turn to the other outsider in the room. I don’t mind a bit, because I understand they have a lot of catching up to do. These sisters — Mary Amundsen, Jane Kassuba and Gail Reynolds — are all together for the first time. Until last October, Mary didn’t even know Jane and Gail existed. Mary was given up for adoption, before their parents were married and had Jane and Gail, and a brother who is now deceased. At the urging of her neurologist, and with the help of Catholic Community Services of Western Washington, Mary went in search of her biological family. Within a matter of days, she was on her computer, Skyping with her sisters. Jane and Mary met first, then Mary and Gail. The gabfest at the dining room table of Gail’s northeast Salem home was their first time all together, and they were generous to let me to be a part of it. What’s unique about their story is that they are full, not just half, sisters. With many reunions like this, decades after adoptions, siblings who find each other often share just one parent. Their mother was Lucy Edmond, their father Thomas Able. The couple became acquainted while working at a fruit packing plant in Wenatchee, Wash. Lucy got pregnant, had the baby in secrecy — in a car of all places — and then gave the baby up for adoption. She probably didn’t have much choice. Her father, I’m told, was a Pentecostal preacher. She likely dealt with the stigma her entire life. Lucy died in 1994. Some of the birth and adoption records, scattered on the dining room table, quote hospital staff saying that when Lucy gave birth, she wanted nothing further to do with the father of the child and at first refused to provide his name. Mary was born on Jan. 27, 1935. Lucy and Tom were married on Aug. 30 of that same year. Nobody knows what transpired in the seven months in between — there are so many questions these sisters will never know the answers to — but Lucy obviously changed her mind about Tom. They were married for 58 years. And they went to their graves with the secret. “We didn’t even have a clue that we had a sibling,” Jane said. When their father’s health was declining, in 2007, Jane sort of jokingly asked if there were any skeletons in the closet that he needed to share. “He hesitated just enough to know there was something there,” Jane said. Six months after he died, their stepmother told them about the baby their mother had given birth to. Apparently the only other member of the family who knew about Mary, and kept the secret all those years, was an aunt. That aunt had in her possession a letter from Lucy admitting that she and Tom had a baby out of wedlock. Mary was raised by her adoptive family in Aberdeen, Wash. Gail and Jane were raised on a farm in Echo, Ore., near Pendleton. Think about that. Just 320-some miles separated them. As they continue to connect the dots, now seven decades later, it is uncanny how they finish each others sentences. If I had not been briefed on their backgrounds, I would never have guessed these women were just getting to know each other. It’s the kind of things that gives you goose bumps, a sensation Jane mentions the minute I walk in the door. And they all get them when they start telling their story. One of the first things they show me is their high school graduation photos. You can see the resemblance. The same face shape, cheekbones and wide-set eyes. 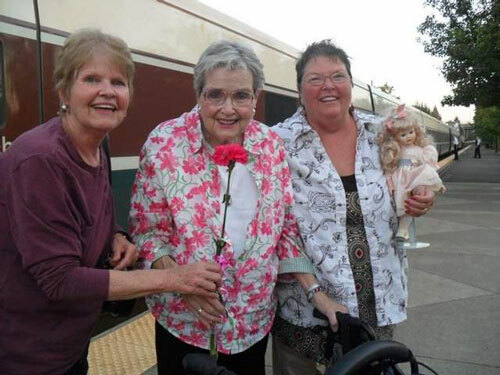 When Mary arrived the night before at the train station in Salem, Jane and Gail were there to greet her. “They sang for me,” Mary said. It was an old playground song with the lyrics “Oh little playmate, come out and play with me, and bring your dollies three …” Jane carried a doll in her arms. “We didn’t have a childhood together,” Jane explained. Mary tells me she had wonderful adoptive parents who loved her and provided for her. The sisters had planned to do some sightseeing while together in Salem. Mary was visiting from Shoreline, Wash., and Jane from Kennewick, Wash. But when I left that dining room table, I had a feeling they were more likely to spend the day connecting those dots than navigating any map. “We feel like we’ve know each other forever,” Gail said. This article appeared in the August 25, 2012 edition of The Statesman Journal. Republished with permission.